Hi! Today’s massive official Patch – v1.10 – is all about improving mid and late game balance, which is especially noticeable on the larger random scenarios. A typical scenario should now have a more gradual buildup. Other goals include finalizing VPN support and tackling the bugs reported by the community and of course many more little fixes and additions as listed below. Our focus will now move to resolving additional multiplayer connection issues, improvements to localized text and adding features requested by the community. We’ve are also working on some big new features for you, which enhance empire building and diplomacy. – The Team @ Triumph Studios. Add an additional city upgrades that act as prerequisites for class T3 and T4 unit production. Also added additional city upgrades for classes without class specific T3 and T4 units that can be build in cities, to maintain cross class balance. Added new Arch Druid city upgrade “Henge”. This city upgrade increases Mana Capacity by +100, allowing you to store more mana. This upgrade requires the Arch Druid’s Dolmen. Added new Arch Druid city upgrade “Megalith”. This city upgrade increases Population by +100. This upgrade requires the Henge. Added new Dreadnought city upgrade “Blast Furnace” which is needed to produce the Cannon unit. This city upgrade also gives an additional +5 production. This upgrade requires the Dreadnought’s Foundry. Added new Dreadnought city upgrade “Juggernaut Factory” which is needed to produce the Juggernaut unit. This city upgrade also heals garrisoned machine units. This upgrade requires the Blast Furnace. Added new Rogue city upgrade “Planar Gate” which is needed to produce the Shadow Stalker and Succubus units. This city upgrade generates an additional +5 mana. This upgrade requires the Rogue’s Palace. Added new Rogue city upgrade “Shrouded Altar”. Monster units produced at this city gain an additional medal Rank. This upgrade requires the Planar Gate. Added new Sorcerer city upgrade “Mana Vault”. This city upgrade increases Mana Capacity by +100, allowing you to store more mana. This upgrade requires the Sorcerer’s Conflux. Added new Sorcerer city upgrade “Wizard’s Academy”. This city upgrade gives an additional +10 Knowledge. This upgrade requires the Mana Vault. Added new Theocrat city upgrade “Celestial Chamber” which is needed to produce the Exalted units. This city upgrads also gives an additional +100 happiness. This upgrade requires the Theocrat’s Conclave. Added new Theocrat city upgrade “Holy of Holies” which is needed to produce the Shrine of Smiting. Also increases Mana Capacity by +100, allowing you to store more mana. This upgrade requires the Celestial Chamber. Added new Warlord city upgrade “Gladiator Pit” which is needed to produce the Blood Phalanx and Warbreed units. This city upgrade also gives an additional +100 happiness. This upgrade requires the Warlord’s Command. Added new Warlord city upgrade “Manticore Lair” which is needed to produce the Manticore Rider unit. This city upgrade also gives an additional +5 Reasearch. This upgrade requires the Gladiator Pit. Reduce the need to rush for T4. Reduce AoE bust damage for T4 units and reduce protective abilities to make them easier to counter when used without support. The Shrine of Smiting now has 20% Fire Weakness. The Juggernaut’s Fire Mortar ability now starts on cool down, Fire Broadside now does 25 physical – was 30 – and Fire Mortar now does 18 physical, 18 fire – was 20 physical, 20 fire. The Eldridge Horror now has Mind Control Immunity and 60% Spirit Protection, instead of Strong Will. The Horned God now has 20% Blight Weakness and it’s Call Lightning ability starts on cool down, now has cool down of 1 – was 2 – is a Full action – was single action. The damage amount not being displayed in game was also fixed. Changed research priorities to reduce AI rushing up the unit tech-tree. To extend the duration of the mid game. I.e. the period focused on T2-3 unit production. Reduce the city growth speed. Changed population growth for cities to 250 – was 300. Changed required population for a City to 12000 – was 10000. Changed starting population for a City to 14000 – was 11000. Changed rebel spawn population loss for a City to 3500 – was 2750. Changed rebel spawn population requirement for a City to 7000 – was 5500. Changed required population for a Metropolis to 22000 – was 18000. Changed starting population for a Metropolis to 24000 – was 20000. Changed rebel spawn population loss for a Metropolis to 6000 – was 5000. Changed rebel spawn population requirement for a Metropolis to 11000 – was 10000. Changed the production value of the Siege Workshop to 10 – was 20. Changed the production value of the Master Guild to 15 – was 20. Lower income where needed – focusing on Mana – to prevent surplus mana. Reduce frequency of occurrence of mana generating structures on RMG maps as a factor of distance from Player’s starting positions. Producing settlers now stagnates city growth, making it more of a choice in the early game. Changed cost for the Pioneer: Gold cost 200 – was 150 – Population cost 2000 – was 750 – Recruit cost 400 – was 300. Tests in the office showed that play style was a large factor in the reported mana surplus issue. To prevent issues with superfluous mana, while not impacting players with a more exploration, expansion or magic based play style. Players can now hold a limited amount of mana at once. A player can hold 500 mana, researching a casting point skill or building a great temple will increase mana cap by 100. To increase the mana spend on spells we’ve reduced the casting cost of maintained spells – to make them more worthwhile to cast – while increasing the maintenance cost – to make which spells to maintain a more deliberate decision. Changed the cost of the Arch Druid’s ‘One with the Elements’ to maintenance 10 – was maintenance 6. Changed the cost of the Arch Druid’s ‘Fertile Domain’ to cast 40, maintenance 20 – was cast 60, maintenance 9. Changed the cost of the Arch Druid’s ‘Insect Plague’ to cast 60, maintenance 20 – was cast 80, maintenance 9. Changed the cost of the Arch Druid’s ‘Poison Domain’ to cast 100, maintenance 30 – was cast 140, maintenance 16. Changed the cost of the Arch Druid’s ‘Thorn Hedge Walls’ to cast 120, maintenance 30 – was cast 180, maintenance 18. Changed the cost of the Arch Druid’s ‘Nature’s Eyes’ to cast 80, maintenance 40 – was cast 120, maintenance 12. Changed the cost of the Dreadnought’s ‘Suppress Nature’ to cast 100, maintenance 40 – was cast 140, maintenance 16. Changed the cost of the Dreadnought’s ‘Dragon Oil’ to cast 120, maintenance 30 – was cast 180, maintenance 20. Changed the cost of the Dreadnought’s ‘Great Mobilization’ to maintenance 80 – was maintenance 64. Changed the cost of the Rogue’s ‘Poison Mastery’ to cast 50, maintenance 20 – was cast 60, maintenance 8. Changed the cost of the Rogue’s ‘Iron Grip’ to cast 40, maintenance 20 – was cast 70, maintenance 9. Changed the cost of the Rogue’s Treasure Raiding to cast 60 – was cast 80. Changed the cost of the Rogue’s ‘Incite Revolt’ to cast 60, maintenance 40 – was cast 100, maintenance 15. Changed the cost of the Rogue’s ‘Corpse Looting’ to cast 60, maintenance 15 – was cast 100, maintenance 12. Changed the cost of the Rogue’s ‘Network of Scrying Eyes’ to cast 60, maintenance 20 – was cast 100, maintenance 12. Changed the cost of the Rogue’s ‘Spy Network’ to cast 150, maintenance 50 – was cast 300, maintenance 36. Changed the cost of the Rogue’s ‘Night Wish’ to cast 100, maintenance 20 – was cast 180, maintenance 18. Changed the cost of the Rogue’s ‘Age of Deception’ to maintenance 80 – was maintenance 64. Changed the cost of the Sorcerer’s ‘Glyphs of Warding’ to cast 40, maintenance 15 – was cast 60, maintenance 5. Changed the cost of the Sorcerer’s ‘Dread Omen’ to cast 60, maintenance 40 – was cast 90, maintenance 9. Changed the cost of the Sorcerer’s ‘Dome of Protection’ to cast 100, maintenance 20 – was cast 120, maintenance 12. Changed the cost of the Sorcerer’s ‘Enchanted Walls’ to cast 120, maintenance 30 – was cast 180, maintenance 18. Changed the cost of the Sorcerer’s ‘Summoner’s Aura’ to cast 100, maintenance 20 – was cast 120, maintenance 12. Changed the cost of the Sorcerer’s ‘Age of magic’ to maintenance 80 – was maintenance 64. Changed the cost of the Theocrat’s ‘Beacon of Faith’ to cast 50, maintenance 10 – was cast 90, maintenance 9. Changed the cost of the Theocrat’s ‘Paid Absolution’ to cast 80, maintenance 20 – was cast 100, maintenance 9. Changed the cost of the Theocrat’s ‘Prayer for the Hurt’ to cast 100, maintenance 30 – was cast 150, maintenance 15. Changed the cost of the Theocrat’s ‘Sanctified Sites’ to cast 100, maintenance 30 – was cast 160, maintenance 12. Changed the cost of the Theocrat’s ‘Denounce City’ to maintenance 20 – was maintenance 16. Changed the cost of the Theocrat’s ‘Hallowed Domain’ to cast 100, maintenance 20 – was cast 120, maintenance 12. Changed the cost of the Theocrat’s ‘Great Purge’ to cast 100, maintenance 40 – was cast 300, maintenance 32. Changed the cost of the Theocrat’s ‘Armageddon’ maintenance 64 – was maintenance 80. Changed the cost of the Warlord’s ‘Authority of the Sword’ to maintenance 5 – was maintenance 6. Changed the cost of the Warlord’s ‘Dread Siege’ to cast 60, maintenance 30 – was cast 80, maintenance 9. Changed the cost of the Warlord’s ‘Inspire Loyalty’ to maintenance 20 – was maintenance 15. Changed the cost of the Warlord’s ‘The Draft’ to cast 120, maintenance 30 – was cast 160, maintenance 18. Changed the cost of the Warlord’s ‘Conqueror’s Feast’ to cast 120, maintenance 40 – was cast 240, maintenance 24. Changed the cost of the Warlord’s ‘Hero Slaying’ to maintenance 30 – was maintenance 24. Changed the cost of the Warlord’s ‘Global Assault’ to maintenance 80 – was maintenance 64. Changed the cost of the Air Adept’s ‘Domain of Winter’ to cast 60, maintenance 20 – was cast 80, maintenance 12. Changed the cost of the Air Master’s ‘Arctic Empire’ to cast 80, maintenance 40 – was cast 100, maintenance 12. Changed the cost of the Earth Adept’s ‘Domain of Earth’ to cast 60, maintenance 20 – was cast 80, maintenance 12. Changed the cost of the Fire Adept’s ‘Domain of the Sun’ to cast 60, maintenance 20 – was cast 80, maintenance 12. Changed the cost of the Fire Master’s ‘Tropical Empire’ to cast 80, maintenance 40 – was cast 100, maintenance 12. Changed the cost of the Creation Adept’s ‘Domain of Life’ to cast 60, maintenance 20 – was cast 80, maintenance 12. Changed the cost of the Creation Master’s ‘Temperate Empire’ to cast 80, maintenance 40 – was cast 100, maintenance 12. Changed the cost of the Destruction Adept’s ‘Scorched Earth’ to cast 40, maintenance 15 – was cast 60, maintenance 9. Changed the cost of the Destruction Adept’s ‘Domain of Corruption’ to cast 60, maintenance 20 – was cast 80, maintenance 12. Changed the cost of the Destruction Master’s ‘Blight Empire’ to cast 80, maintenance 40 – was cast 100, maintenance 12. The distance between player start positions now take into account the amount of players with regards to map size. Few players on a large map will result in a significant nearer distance. Likewise, many players on a smaller map will result in a slightly larger distance. XL map feature distribution now more closely resembles the smaller maps. Rust Strike can now be used twice on same unit. Units can now attack an enemy after using Sprint. Rogue Assassin now has Wall Climbing, Removed Pass Wall and Sprint Abilities. Theocrat Exalted hp set to 50 – was 55 – and no heal ability on levelling. ArchDruid Summon Beast Horde now summons Blight Tusk Boars, Bleak Wargs, Dread Spider Babies, Hunter Spider Babies, Vampire Spider Babies and Dire Penguins. Sprint now has a cooldown of 3. Units may now attack after using sprint. Fixed an issue where the Node Serpent’s death animation glitched when hit by ‘Huge’ attacks, such as the Hellfire spell. Fixed an issue where some structures – e.g. hasteberries – showed an incorrect state after loading a save game. Improved VPN support to local multiplayer. Campaign: All heroes and leaders will have Resurgence, allowing them to return from the dead if their side wins the battle. This is disabled in “Hard” mode. Added tier level to unit info, allowing preview of the tier level in the city production panel in both the popup and the unit panel. Added keyboard shortcuts for next/previous city. Defaults bindings are “;” and “,”. Fixed an interface dead state for the item forge by closing the interface when the city is deselected. Fixed an interface dead state in the Tome of Wonders after combat was completed. Fixed a glitch so spell icons now no longer go beyond the bounds of the overview panel. Fixed a bug where the vision fog area on the mini-map did not match the actual vision fog area on the world map. Fixed a bug where dwelling icons in the Tome of Wonders were not refreshing. Added a ‘Save Game’ and an ‘Exit Game’ button in the player disconnect window. Fixed an issue where the damage values in the abilities list would disappear after changing tabs. Fixed a bug where the icons in the dragon dwelling text in the Tome of Wonders were clipped in-correctly. Fixed the French tool-tip for “order of sacred support”. Localized the report feedback button. Improved the scrollbar: holding the mouse down on the buttons now keeps scrolling and the scrollbar in the tome of wonders now also support scrolling by clicking on the scrollbar background. Fixed an issue in the key binding screen where the entire row would receive input. Enlarged the textfield of the target text to fix a bug in Russian where the text would be cut off. Enlarge the textfield of the “Search local” text to fix a bug in Russian where the text would be cut off. The save and load menu cannot be opened anymore when the new turn panel is opened. This fixed unresponsiveness of the game in this instance. When the reward from a dwelling opened up and a battle interrupted this screen, the reward was lost. The reward screen now re-opens after the battle has finished. Fixed an issue with the courier items screen: the hero icons would not show up when sending a second item right after sending the first. Added multichannel (i.e. 5.1) audio support. Fixed an issue with event sounds being audible for all players. Changed new turn sound trigger to new turn instead of end turn, allows players to hear when it’s their turn in hot seat. Mini-expansion player site which is generated for each player starting position has been moved from ~6 hex to ~8 hex distance from starting location. Fixed a bug in underground where cave exits were only being generated near player spawn area, and never on a more global level. Fixed a bug in the ‘Land’ type random map where Monster Dens and Haunted Boneyards were never being generated. Fixed a bug in the Underground where too many unit spawning structures were being generated. Fixed a clustering issue with unit spawning structures; they should be spaced out more now. Slightly increased chances of Flow Rock Quarry and Trading Posts being generated at expansion sites, instead of tier 1 structures like gold mines and mana nodes. Campaign: Fixed various issues with ‘capture’ quests. 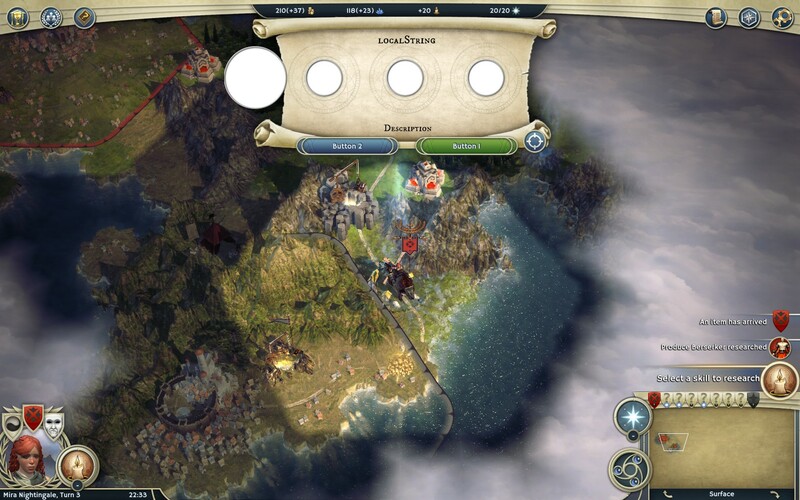 Campaign: Fixed a crash when retreating heroes and leaders from campaign battles. Campaign: Fixed the level cap in the campaign maps. 4th Elven Court map: Fixed an issue where Bormac was set loose by AI. 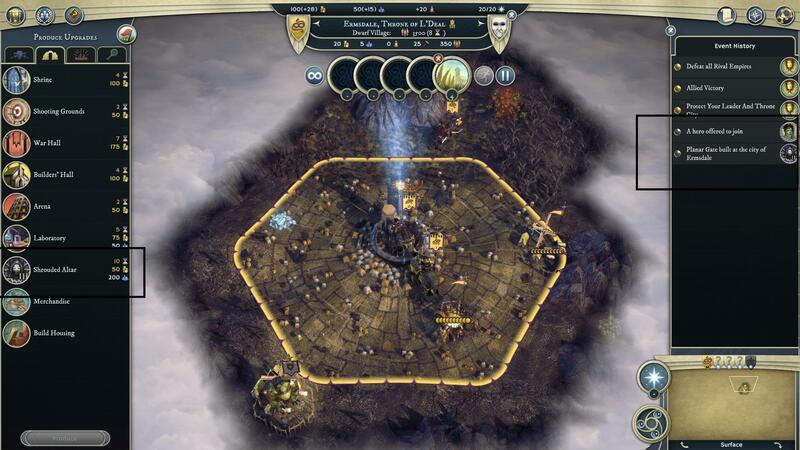 4th Commonwealth map: Prevented a situation where you could kill Carishar without it triggering your victory. One of the last Commonwealth map: Fixed the ‘Help the Dwarves’ and ‘Slay the Frost Dragon’ quests, they did not always trigger correctly. The last Elven Court maps: Made sure fairies spawned correctly in one of the final Elven Court maps, provided you had done the necessary quest in an earlier scenario. Taming of the Great Khan: Quests now give the intended rewards. Elven Resurgence: Removed the defenders from player 2’s heart of blight. Elven Resurgence: Reduced Player 1’s starting units, to match the strength of the other players. Elven Resurgence: Increased the gold income for players 3, 5 and 6, , to match the income the other players. The game doesn’t crash anymore when a hatched egg of a dead hero is selected. The game doesn’t crash anymore when a game is loaded which was saved before patch v1.09 in which an egg had just hatched. The game doesn’t crash anymore when an item is sent to a hero who just died. Strategic AI will no longer build a settler if doing so would cause a city to become underpopulated. Fixed issue in classic turns which caused turn order to be handled incorrectly in some cases, when a player is defeated. Fixed a crash occurring when an item is traded and the item owner died before the trade was resolved. Fixed an input control issue to allow 3rd party software to map gamepad button. Fixed an issue where second player of classic turn MP game would get a new hero every time you load a save file. Fixed an out of sync issue with the Freeze Water spell. Fixed a bug where disabling the ‘Remember Password’ check-box didn’t have any effect the next time the launcher was started. Play as guest check-box is now remembered for the next time that the launcher is started. This also ensures initial settings – e.g. graphics settings – are taken from the Guest profile, preventing players that only played as ‘Guest’ from having their settings be reverted to default settings.. Fixed minor issue for players with a ‘.’ (dot) character as the final character of their account name. When the profile data is corrupted then the user will be notified when launching the game. Fixed a crash for players that are loading corrupted save games. Player now gets a notification when the connection to the server is lost. Fixed a mouse clipping issue that sometimes occurs when having multiple monitors. Fixed an issue with auto-move which could cause the game to crash on pressing the end turn button. Fixed an issue with custom hero names not showing up properly in the event that shows up when an egg hatches. Fixed an exploit where concealed units in a visible stack could be found through the morale tooltip. The statistic screen now shows data of the last turn – the one that’s selected – correctly. Fixed an issue with the select next hero shortcut: the hero now gets selected instead of the city when the hero is standing on a city. Fixed a bug with the cycling through the heroes when the player first selects a hero stack with the mouse. Fixed issue with item bags not being rendered correctly when they spawned on top of mountains, which made it seem as if no reward would spawn.